Release Date: May 5th, 2006 (Regal Union Square 14) by Delphi Film Foundation. The Cast: Roger Rees, Mary McDonnell, Paul Fitzgerald, Christina Rouner, Robert Wisdom, Mark Joy, Michael Goodwin, Tom Bloom. BASIC PREMISE: Nat (Rees), a Virginian farmer, fights for the re-possession of his precious family farm. ENTERTAINMENT VALUE: From the very beginning, the conflict is clear when two wealthy, insensitive lawyers from Washington, D.C. (Rouner and Fitzgerald) buy Nat’s farmhouse and evict him along with his wife Amy (McDonnell) and their two young children, but not before Nat realizes he has been cheated and wants his farmhouse back—after he signs the contract. After the eviction, Nat simply won’t go away by living in a cave near a creek not far away from the home. His actions while at this cave are quite strange, yet humorous. Meanwhile, the lawyers get treated with hostility when they try to interact with the townspeople. For example, one of the lawyers tries to buy beer at a pub, but gets refused. 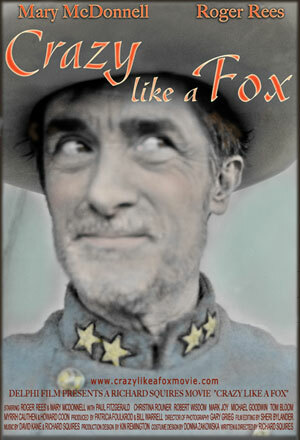 Much of Crazy Like a Fox plays out predictably without any surprises, but Roger Rees gives a charming performance as the odd, but likable Nat—unlike the two lawyers who come across, convincingly, as cold, mean and arrogant. In other words, it’s easy to hate the two lawyers while rooting for Nate and caring about his family up to the very end. Writer/director Richard Squires includes many breathtaking nature scenes which celebrate the genuine beauty of Virginian wildlife, which becomes an enchanting character of its own. SPIRITUAL VALUE: Nat’s farmhouse means much more to him than just a bunch of material that provides safety and survival. To him, his home represents all the memories from the past which, inevitable, has always been a part of him. Taking it away from him would be like taking away his arm or his leg. It’s inspirational to watch him risk his marriage and life to defend his property in any way possible—but without resorting to violence. The way the townspeople end up supporting him is truly heartwarming and uplifting. IN A NUTSHELL: Heartwarming and enchanting! Roger Rees gives a charming performance!